Almost everyone today is a digital marketer. Really, can you market a business of any kind today without a digital presence? But not every digital marketer is a content marketer. You can have a digital presence — a basic website or social media page, PPC ads or targeted “promoted” posts, an email contact list — without really investing in content. Digital marketing includes paid placement in search engines, boosted posts and paid ads in social media, and sales-oriented emails. Digital marketing focuses on the sale. While some content is involved, the emphasis is more often on advertising and driving immediate action. Digital marketing often takes a more “outbound” approach of pushing a sales message into view of prospects, while content marketing is more about awareness and information than an immediate sale. Content marketers create and use a range of (often mostly digital) formats and channels to provide information and gain awareness for their brand. Carefully crafted social media videos, contributed articles and guest blogs, how-to articles on a website and well-designed infographics are all digital tools in a content marketer’s toolkit. But the difference between digital marketing, in a broad sense, and content marketing is the focus on information. Digital marketers use more quick, catchy tactics, while content marketing takes a deeper approach to providing the kinds of information consumers want when making a major investment or that B2B buyers seek before engaging with a vendor or supplier. Three in four B2B decision makers strongly agreed with the following statement in a DemandGen survey: I place a higher emphasis on the trustworthiness of a source (when evaluating content). Content marketing can be a trustworthy source if it focuses on answering questions and solving problems, along with telling stories that engage potential customers — not just selling. It is this type of content that best builds brand awareness, improves brand perception, drives website traffic and fosters loyalty amongst followers and customers. But content alone falls short of one major objective that defines inbound marketing. 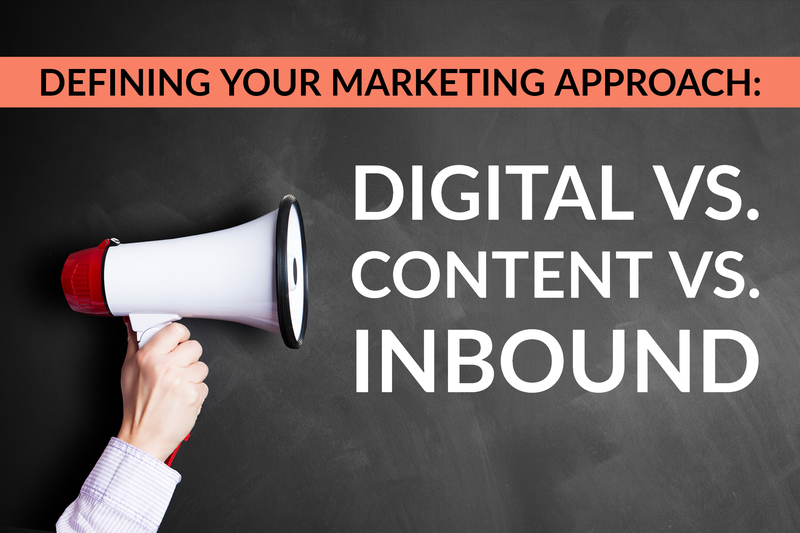 Inbound marketing uses informational and engaging digital content to attract visitors to the company website AND convert those visitors into leads and customers. Simply creating and promoting content, no matter how engaging it is, is not inbound marketing. Inbound marketing requires deploying the content you create in a way that captures leads through your company website, nurtures them toward a sale, and continues to provide support and engagement to enhance the customer relationship. Inbound marketing can employ the paid aspects of digital marketing alongside the trusted development of informative content to increase search engine visibility and attract visitors to your website. Once those visitors have found your site, inbound marketing strategies including the use of calls-to-action, downloadable offers, and landing page forms to capture lead information take the results of that digital content to the next level. Once visitors have been converted into leads, inbound marketers use a targeted feed of additional content to nurture those leads until they are qualified to be turned over to sales. That difference is why it is essential for you to understand which strategy you are focused on. 1. Identify your audience and the digital channels that will most effectively reach that audience. Review those personas and what you know about them to determine which digital channels your inbound marketing content will target. B2B brands may place a greater emphasis on LinkedIn and industry media for content promotion, while B2C brands will lean more on Instagram and local or mass media sites (including customer review sites such as Yelp or TripAdvisor), depending on the market being targeted. 2. Identify the topics and information your audience is seeking out and searching. The key to inbound marketing is bringing your audience to your content, rather than pushing your content to your audience in obtrusive ways. This requires creating the kind of content your audience is seeking out. Think about those buyer personas — What is your ideal customer looking for? What problem can you help them solve through the content you create? 3. Plan a complete campaign around a topic. Your campaigns should include a lead generating offer, awareness content, and any complementary outbound or advertising tactics to be used to increase reach, as well as the lead nurturing workflow to be used when visitors convert into leads. This means planning content for all stages of the sales funnel (aka buying cycle or customer journey). Remember to include multiple formats and channels — blog posts, social media updates, videos, infographics, bylined articles in industry media — to provide information in a number of ways to reach different research styles. And don’t forget to plan how you will nurture those leads once you have acquired them. A series of automated emails offering additional content builds a relationship, and the actions leads take in response to those emails signals when they are moving closer to being qualified for a more personal sales approach. 4. Create content that is engaging, compelling, complete and correct. It tells a story and is compelling. Content that checks all of those boxes takes time and expertise to create, so be sure you don’t make the mistake of thinking content creation is something to be delegated to the newest employee or placed at the bottom of a priority list. 5. Launch and analyze; review and repeat. Everything in place? Then it’s time to launch your campaign. By creating an entire campaign at once, you can support each individual piece of content with others in the campaign. Use social media updates to promote your new blog posts. Use blog posts to highlight successful contributions of bylined articles to industry media. Include calls-to-action in your blog posts that promote your downloadable offers. Still unclear about how to go from a marketing approach that simply uses digital channels to promote or content to build awareness to a marketing approach that uses informative content, distributed on multiple digital channels, to attract website visitors and convert them into leads and customers? See an example of inbound marketing in action, complete with actual downloadable offers, blog posts, social media updates and emails. You’ll find them all in our Creating A Winning Inbound Program sample.